Semi-solid baby food to go: double-walled, stainless steel thermos flask 'Dog' keeps baby food ready-to-eat when you are out and about. The stainless steel flask keeps food hot or cold, is leak-proof and easy to fill. 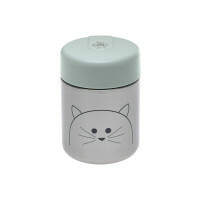 Product information "Food Jar, Little Chums Dog"
description & equipment Semi-solid baby food to go - flasks with dog, cat and mouse motifs from LÄSSIG’s Little Chums Collection are now also available as a practical companion when you are out and about. With the double-walled thermos flask made of stainless steel, the semi-solid food or lunch for your little one is immediately ready to serve when you are on the go. The stainless steel flask keeps food warm or cold, and the silicone ring integrated in the cap, ensures no leaking occurs. Very practical: The wide opening of the stainless steel flask makes it easy to fill, use and clean. It’s robust, easy to handle and practical in catering for big and small appetites when on the go. 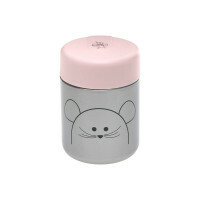 The thermos flasks from the Little Chums Collection are available with three different animal motifs – dog, cat and mouse.